Donald Trump, backed into a corner after the emergence of a video of him discussing sexual aggression towards women, held nothing back in the second presidential debate on Sunday night. The Republican nominee said that if he was president, Hillary Clinton "would be in jail" over her email controversy and claimed that she "has tremendous hate in her heart". In what was one of the most negative and acrimonious debates in US presidential history, it was a matter of minutes before the lewd tape, in which Mr Trump brags about "grabbing p----" and forcibly kissing women, was brought up. Mr Trump had set out his stall half an hour before the start of the debate by holding a press conference alongside three women who have claimed they were sexually assaulted by Bill Clinton. 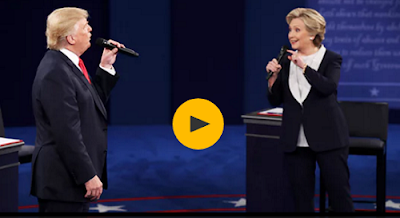 After apologising for "locker room talk" in the video during the debate, Mr Trump said those were just words, whereas "Bill Clinton was abusive to women". Mr Trump then attacked Mrs Clinton over her use of a private email server while she was US secretary of state, saying that if he was president she would be in jail. "I hate to say it but if I win I'm going to instruct my attorney general to get a special prosecutor to look into your situation," he said. "There has never been so many lies, so much deception. The people in this country are furious. In response, Mrs Clinton said: "It's just awfully good that someone with the temperament of Donald Trump is not in charge of the law in this country." Mr Trump replied, to cheers in the audience: "Because you'd be in jail." In an awkward moment for the Republican, Mr Trump said he disagreed with Mike Pence, his vice presidential running mate, who declared last week in his debate against Tim Kaine that the United States should be prepared to use military force if needed in Syria. "He and I haven't spoken and I disagree," Mr Trump said. Mrs Clinton went on to accuse Russia of trying to tilt the 2016 presidential election in Mr Trump's favour with a series of email hacks. "They're doing it to try to influence the election for Donald Trump," she said. The final question of the night to the candidates was what they respected about each other. Mrs Clinton said: "I respect his children. His children are incredibly able and I think that says a lot about Donald." Mr Trump said: "I will say this about Hillary - she doesn't quit, she doesn't give up. I tell it like it is. She's a fighter." Having avoided a handshake at the start of the debate - Mrs Clinton had paused as they walked towards each other - the candidates shook hands, awkwardly, at the end.